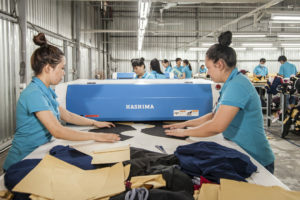 G&G Garments II Ltd and G&G Garments II Garment Factory is a full package knit and woven garment manufacturer based in Ho Chi Minh City, Vietnam. We currently produce a variety of embellished and unembellished women’s wear garments with a strong focus on detail. G&G Garments II has been producing womens wear garments for over 30 years, starting in China and expanding its operations to Vietnam in 2002. We pride ourselves on being a one-stop manufacturer for all womens wear garments including dresses, blouses, pants, jackets, shirts and skirts. Our clients are from all over the world including the United States, Europe and Canada. G&G Garments II in Vietnam is structured as a vertical operation. We specialize in beading, embroidery, sequins, embellishments and fabric manipulation including pleating on both knits and women womens wear garments. Our unique expertise is in original embellishment design concepts offered by our New York and Vietnam design studios. Our design studios design with a brand’s vision in mind, always meeting expectations with competitive price points. We also provide various inspirations, trend concepts and a wide range of the latest fabrics. Our factory is staffed with production merchandisers as well as technical and quality control personnel, who are extremely responsive to all aspects of the production process. The production merchandiser structure provides all clients with a level of personalized service, communication and accountability that cannot be achieved by working with other offshore garment factories. Our fully-equipped state of the art sample room provides product development and allows us to meet the most difficult customers needs and requirements. G&G Garments II Garment Factory in Ho Chi Minh City is certified and compliant by our customers and adheres to all local governing requirements. When looking to do business with a leading innovative garment factory in Vietnam, there is no need to look further. Please send us an email with your tech-packs and other quantities ASAP. You can be sure immediate attention will be given to your creation and production.